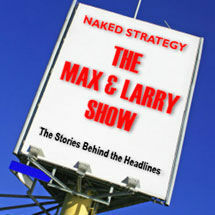 In the week that sees Al Gore with a Nobel prize, Larry & Max ask whether it’s possible to be “too smart to be president”? Or are some people just bad at the power grabbing stuff that CEOs, Presidents, and Kings are good at? Is it sour grapes from the power incompetents who pretend they are too good to have real influence? And what should we do about the despots, autocrats, oppressors, slave drivers, and tyrants who stab you in the back, take credit for other peoples work, and drive out great ideas because they make them look bad? Finally, if you're faced with having to deal with zeros, frauds, and bastards, how do you handle them? According to Max, you've got three (and a half) choices. . .